The Sheraton Hotel (Lai-Lai Fan Dien) houses a number of renowned restaurants, including the Japanese Momoyama. Just a few steps away from the Shandao Temple MRT Station, the hotel is conveniently located. 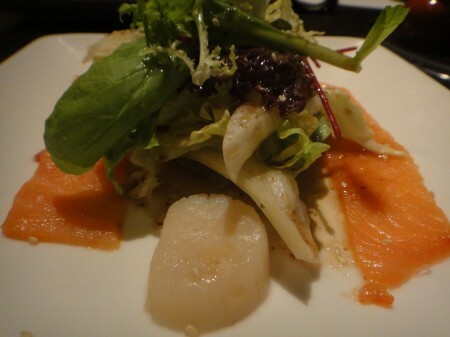 We ordered a set menu that included a variety of savory items, starting off with a sour vinaigrette salad with raw salmon and scallops which was really great – I loved it. Just to warn you, if you’re not a big fan of sour stuff, you might not be able to finish the bowl. The sweet shrimp, yellowfin tuna and assorted sashimis was delicious – this type of plate seems to be quite a popular starter at Japanese restaurants here in Taiwan. A small bowl of glass noodles, tofu and vegetables was intejected in between the smaller plates and the mains. To fill our bellies a bit more, we had a plate of shrimp, sweet potato and taro tempura as well as a AAA beef shabu shabu set up for us along with some white rice and pickled vegetables. The shabu shabu concept allows everyone to cook their meat exactly as they’d like it. For dessert, we had a light almond tofu sweet soup with longan fruits inside. This was a perfect way to end the meal! Tags: Almond Tofu, Glass Noodles, Hotel, Longan, Noodles, Salad, Salmon, Sashimi, Shabu Shabu, Shandao Temple Station, Sheraton, Shrimp, Taipei, Taiwan, Tempura.